The German Jagdpanther is regarded by the ordnance experts as one of the best tracked weapons systems during the World War 2. The awesome Pak43/3, L71 88mm gun was mounted on the proven Panther medium tank chassis. The gun was installed into the box shaped superstructure which used thick steel armor of 80mm at the front and 50mm at the sides. These frontal and side armor plates were effectively inclined to obtain an improved protection. The gun mantlet called "Saukopf" (sow head) had a thickness of 100mm. A ball mounted MG42 bow machine gun was installed at the right side of the main gun. Weighing in at 46 tons and propelled by the powerful Maybach V12 cylinder engine, this tank destroyer had a well-balanced fire power, protection and mobility to high standards. Mass production started in January 1944 at MIAG firm, and during its production career, several improvements and alterations were made with feedback from the front lines. Early production models used a nearly flush gun mantlet collar, but it was replaced with a larger, bolt-fixed collar in October 1944. Larger diameter idler wheels were introduced at the same time. A heater for the crew compartment, and the same exhaust covers as equipped on the late production Panther G tanks were added, beginning from December. 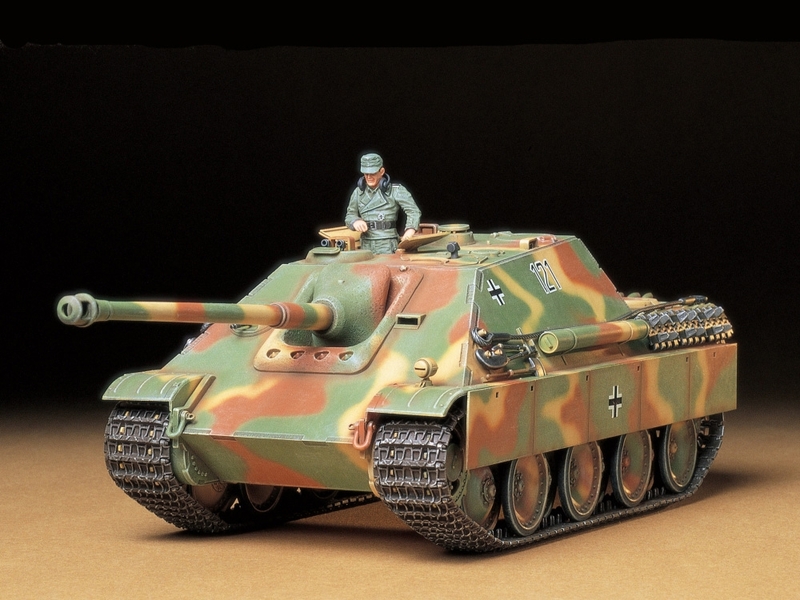 The Jagdpanther was first deployed to the Normandy campaign in June 1944, and 415 units were produced until April 1945.